@SuppressWarnings annotation is one of the three built-in annotations available in JDK and added alongside @Override and @Deprecated in Java 1.5. @SuppressWarnings instruct the compiler to ignore or suppress, specified compiler warning in annotated element and all program elements inside that element. For example, if a class is annotated to suppress a particular warning, then a warning generated in a method inside that class will also be separated. You might have seen @SuppressWarnings("unchecked") and @SuppressWarnings("serial"), two of most popular examples of @SuppressWarnings annotation. Former is used to suppress warning generated due to unchecked casting while the later warning is used to remind about adding SerialVersionUID in a Serializable class. Since @SuppressWarnings indicates potential programming error or mistake, it's recommended to use them sparingly and instead try to fix actual problem which is triggering that warning. Having said that, there are conditions, especially while using generics in Java, when you are absolutely sure that things won't go wrong, you can use @SuppressWarnings to suppress those warnings. Also, worth following are advised given by Josh Bloch in his famous book Effective Java, a must read for every Java programmer, to document reason for suppressing a warning as a comment. 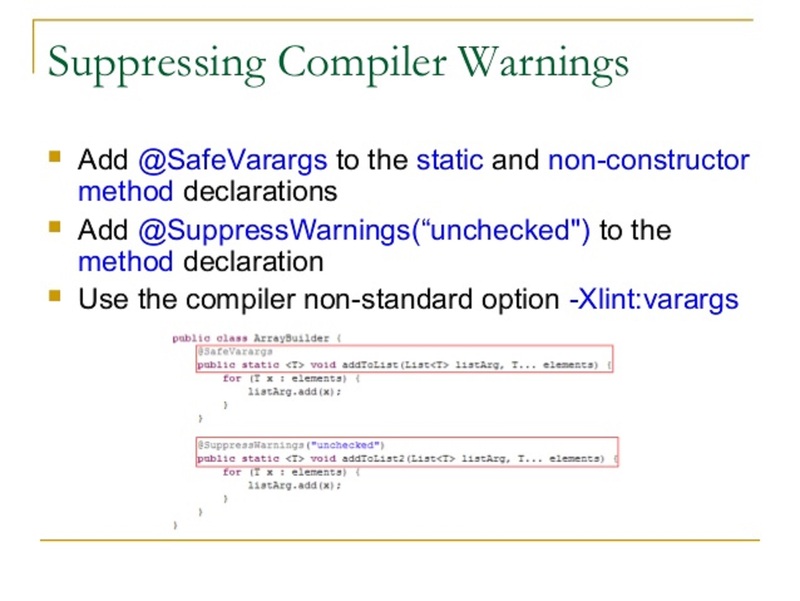 Different compiler and IDEs support different list of @SuppressWarnings options. It seems IDE like Eclipse and Netbeans support more options than standard javac compiler. You can get a list of supported @SuppressWarnings option for Java compiler, by running javac -X command. Here is supported option for javac 1.6.0_26. You will see examples of a couple of these options, in our example of how to use @SuppressWarnings annotation in Java. 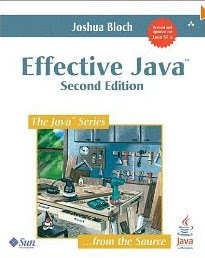 To learn more about why you should suppress warnings, see Effective Java 2nd Edition by Joshua Bloch. How to @SuppressWarnings in Java? In the last couple of paragraphs, we have seen what is @SuppressWarnings and list of @SuppressWarnings options supported by javac compiler. Now we will see, when these warnings occur and how does it help to minimize potential errors? If you are coding in Eclipse IDE, then you are likely to see many warnings as soon as you write code, which triggers any of these warnings. If you are compiling using javac, then you won't see all of these warnings, until you compile using -Xlint option. javac -Xlint will show all warnings supported by javac compiler. One of the simplest examples is implementing Serializable interface and forget to declare SerialVersionUID, which could break your application in future if the structure of class changes. here, we have used ArrayList as raw-type, and Eclipse is quick to point out that. Now, if you type Ctrl+1 which is Eclipse shortcut for show hint, it will give you the option to use @SuppressWarnings at main (method level) or at names (local variable level), always choose the lowest level, which is a local variable in this case. If you choose to put @SuppressWarnings("rawtypes") at the method level, Eclipse will suppress all raw-types warnings inside that method. Note: RawType.java uses unchecked or unsafe operations. Similarly for an unused variable, Eclipse shows warnings, which can be suppressed by @SuppressWarnings(unused). Remember, by issuing these warnings, IDE and compiler help to find potential bugs at code time and compile time. 1) Never put @SuppressWarnings("unchecked) or other options, at the class level, this would potentially mask critical warnings. 2) Use @SuppressWarnings at the smallest scope. Which means if the warning can be removed by putting @SuppressWarnings at a local variable then use that instead of annotating whole method. It's also worth knowing that suppress warnings annotation can be applied to class, field, method, parameter, constructor and local variables. 3) While using @SuppressWarnings("unchecked"), add a comment to explain about "why a particular portion of code is type-safe" before suppressing this warning. Every unchecked warning is an indication of potential ClassCastException at runtime, so don't ignore them. 4) Don't use @SuppressWarnings("all"), it will suppress all warnings, which can mask potential warnings which could lead to RuntimeException when you run the program. That's all on what is @SuppressWarnings in Java, list of options supported by @SuppressWarnings and how to use them at class, method and field level. It's important to use them correctly, and you can choose to pay attention to some of them. At the same time, I don't suggest to suppress every warning shown by Eclipse, because it will clutter your code with lots of annotation, instead choose one's which really matters e.g. serial, uncheck or rawtypes. Java In-Depth: Become a Complete Java Engineer! How clone method works in Java? How to write Production quality code? How to loop over two dimensional array in Java?